There are thousands of other citation styles out there - the use of which one varies according to scholarly discipline, college requirements, your professor’s preference or the publication you are writing for. Sign up to Cite This For Me to select from over thousands of widely used global college styles, including college variations of each. If you are looking to cite your work using MLA formatting, or your discipline requires you to use the APA citation format, you’ll find the style you need on the Cite This For Me's website. As well as the Chicago citation generator above, Cite This For Me provides open generators and style guides for styles such as ASA, AMA or IEEE. You can find your college’s style by logging into your Cite This For Me account and setting your institution in ‘My Profile’. Whichever style you’re using, make sure that you apply the recommended method consistently throughout your work. 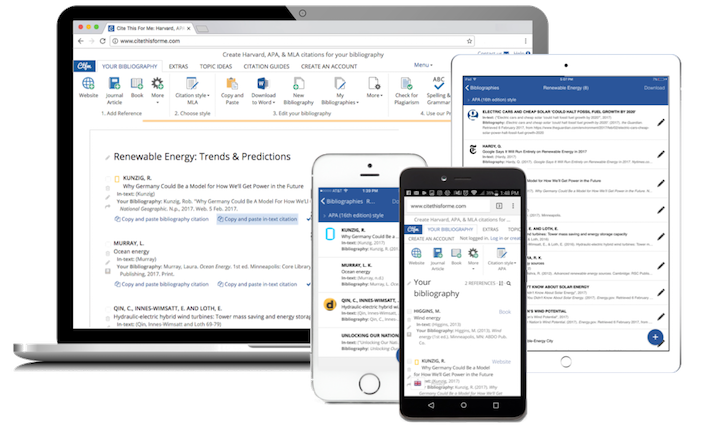 Our multi-platform tool is designed to fulfill all of your referencing needs - whether you’re working at home, in the library, or on-the-go. With features such as Photo Quotes, which translates printed text into digital text for you to save as a quote, and organisational functions. Sign up for free now to add and edit each Chicago citation on the spot, import and export full projects or individual entries, make use of our add-ons and save your work in the cloud. Or step it up a notch with our browser extension - work smarter by citing web pages, articles, books and videos directly from your browser whilst you research online. Have you found a relevant book in the public library? Or stumbled across the perfect source to support your thesis in an archive? Wherever you are, cite your sources on the move with your mobile phone or tablet - scan the barcode of a book with Cite This For Me mobile app to add fully-formatted citations to your projects.